Photo: Martin Luther King speaking at Michigan State on Feb. 11, 1965 (top). Two photos below, MLK and Duffy Daugherty with Jimmy Raye at 1966 spring game. Note: Youtube below is MLK accepting the Nobel Prize for Peace in December 1964 in Oslo. Martin Luther King Jr. visited Michigan State University’s campus and spoke to a full house of 4,000 that greeted him with a standing ovation on Feb. 11, 1965 at The Auditorium. Only two months earlier King had accepted the Nobel Peace Prize in Oslo, Norway. King’s appearances was a fund-raiser for causes to help with voter registration in the South as state and local governments resisted newly passed legislation ordering desegregation. MLK’s East Lansing speech praised Michigan State president John Hannah, whom President Dwight Eisenhower had appointed in 1957 as Chairman of the Civil Rights Commission. King urged the government to adopt Hannah’s recommendation to use federal registrars to overcome widespread discriminatory voting practices in the South. When King finished his Michigan State speech, the students rose again with a second standing ovation. Less than a month after King’s trip to East Lansing, “Bloody Sunday” took place on March 7 in Alabama when 600 Civil Rights protesters attempted to march from Selma to Montgomery. Six months after King’s visit to Michigan State, the Voting Rights Act of 1965 was signed on August 6 by President Lyndon B. Johnson. Time had been neutral for Daugherty throughout his coaching career. He did not wait for approval from the alumni to tell him when the time was right to recruit black athletes. Daugherty did not wait to defy Jim Crow and put on clinics for black high school coaches in the South. He did not balk when his 1966 team, a majority of who were white, voted two black team captains. Clinton Jones and George Webster are believed to be the first pair of black team captains in major college football. Daugherty also knocked down the last position of white supremacy on the football field when he decided time was neutral for a black quarterback as a starter. Jimmy Raye of Fayetteville, North Carolina, was Michigan State’s first black starter in the 1966 and 1967 seasons. 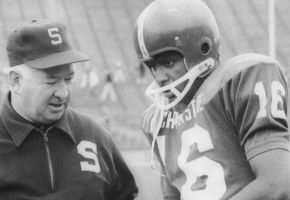 Daugherty later encouraged Raye to join in his staff in 1971 as a pioneer among black assistant coaches. Another legacy within Daugherty’s legacy is the number of black players on his roster who did not turn out to be stars, starters or even play. It is important to remember the 1950s and 1960s was an era when professional teams only kept black athletes who were starters. Daugherty was willing to take a chance on a lightly recruited black player who may not turn out to be a star. In 1966, Michigan State had 20 black players with 11 starters and nine backups. Daugherty’s Spartans were far ahead of other schools considered leaders in integration. In 1967, USC won a national title with only seven black players, although the Southern California school had a long history of integration. But the Trojans’ 1972 national championship team more closely resembled Michigan State's 1966 club when the roster numbered 23 black players. In 1970, USC was the first integrated team to play at Alabama's Legion Field with a roster that started to catch up to Daugherty’s record. In the famed 1970 game at Alabama that was not on television, USC started five black players -- quarterback Jimmy Jones, fullback Sam Cunningham, tailback Clarence Davis, defensive end Tody Smith (Bubba Smith’s little brother) and linebacker Charlie Weaver – and had 17 black players overall on the roster. Daugherty's courage to act without waiting for alumni approval separated him from other coaches. He was on the right side of history. It was in the mid-1960s that MLK began to appeal to the morality of Americans in the cause of the Civil Rights movement. Alabama's first black students were admitted in 1963, but between the 1963 Birmingham violence and the 1965 Selma violence, Alabama coach Bear Bryant was unmoved. He waited until 1970 to sign Wilbur Marshall as his first black player -- one year after Alabama high schools desegregated. Birmingham, home to Legion Field, became known as "Bombingham" for the number black homes and churches bombed. Bryant told coaches and others he was waiting for the alumni. In 1970, Bryant told Conredge Holloway of Huntsville, Ala., he would recruit him but not as a quarterback. Bryant explained the alumni weren’t ready for a black quarterback. Holloway instead played at Tennessee, where he was the school’s first black quarterback and a three-year starter. Dan Daugherty, Duffy’s son, said Duffy’s father Joseph Daugherty taught his children from an early age not to judge people by the race, creed or religion. The Daugherty ancestors were Irish protestant who left Ireland during the potato famine for Scotland to work in coal mines that fueled the Industrial Revolution. That explains why Duffy, with his Irish surname, has been sometimes identified as Scottish. In both Ireland and Scotland the Daughertys faced religious conflict. Joseph’s Daugherty’s parents subsequently left Scotland for America to work in the central Pennsylvania coal mines. On Bloody Sunday, the marchers were beaten and turned back by state troopers and sheriffs. Among the marchers was John Lewis, then a founding chairman of Student Nonviolent Coordinating Committee (SNCC) and now a U.S. Congressman from Georgia since 1987. King joined the protesters two days later in attempt to complete the march, but he decided to pull back for the protesters' safety when they were met by troopers, sheriffs and a mob of white citizens. That night a white minister from Boston, James Reeb, who had joined the protest with other Americans from across the country, was killed in downtown Selma by white attackers. Before attempting a third march, King requested a court order for protection; the request was granted. The march resumed on March 21 with military troops protecting 3,2000 protesters on the walk. They arrived March 25 in Montgomery.